1.Heat a 1 tbsp of olive oil in a pan and add onion. Cook for about 6 minutes. Then add garlic. 2. Add all remaining sauce ingredients except the raisins and goat cheese. Reduce heat to low, and cover. Cook for at least 30 minutes as you prepare the cabbage leaves. 3. Boil water in a large pot. Peel off the outer leaves of the cabbage and compost. Peel cabbage leaves and blanch leaves for about 6 minutes or until they are soft. 4. Add raisins to the sauce and cook on very low. 5. Carefully dry each cabbage leaf. 6. Now carefully spoon a thin layer of filling onto the bottom of the casserole dish. Next add a layer of blanched cabbage leaves. Then add another layer of filling then layer once again with blanched cabbage leaves. Repeat this process again, but before you put the last layer of cabbage, sprinkle your goat cheese over the filling. Then add your layer of cabbage. 7. Spread about half of the tomato sauce in the bottom of a large Dutch oven or other heavy pot. 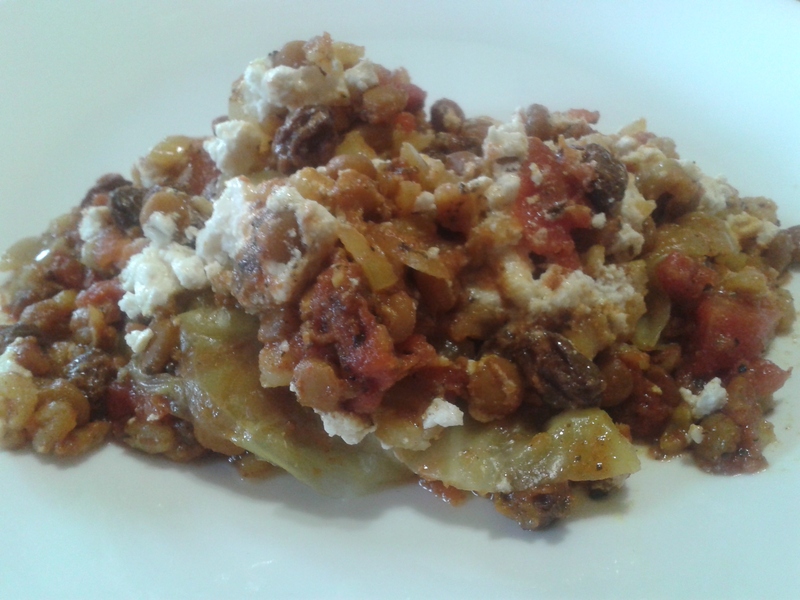 Place each cabbage roll, seam-side down, on top of the sauce in a single layer. (It’s okay if it’s a snug fit.) Spread the remaining sauce over the rolls. Cover and cook on your lowest heat setting until the cabbage is tender, about 45-60 minutes, being careful not to burn the bottom. 8. To serve, place two cabbage rolls on a plate and cover with sauce. -Some people add sauerkraut to the filling to create a German/Polish tasting dish. -You can also add basil or even mint. Sauce: In a sauce pan add the 15-oz can of tomato sauce and about ½ cup of raw honey or maple syrup or to desired sweetness. Cooking Instructions : Place casserole in oven for approximately 1 hour. Then top with sauce. Alternatively you can also freeze this.